A 28 y o female with right orbital proptosis and congestion. 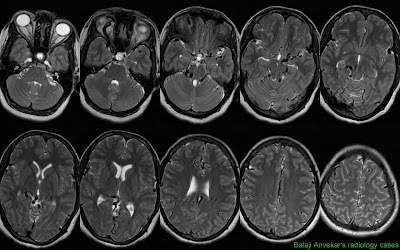 This MRI study shows abnormal serpigenous T2 flow voids along tentorium and cerebral convexity dura, at incisura suggestive of Dural AV Fistula. An associated abnormal dilatation of right side superior ophthalmic vein and orbital proptosis. Superior sagittal sinus show normal T2 flow voids but abnormally smaller in caliber. A rare abnormal connectivity between arteries and veins, lies exclusively along dural covering of the brain or spinal cord and referred accordingly as a Cranial and Spinal Dural AVF. The fistulous communications seen as serpigenous dilated vessels with T2 flow voids along dura overlying cererebral convexity and along tentorium. Frequently the blood flow in a DAVF is very high, and it may cause blood to flow in the opposite direction of normal over the brain's surface. Commonly diagnosed in women over the age of 40 years. Unlike AVMs, which are thought to be present from birth, cranial DAVF most often develop later in life following hypoplasia or chronic thrombosis of dural venous sinuses particularly superior sagittal sinus. 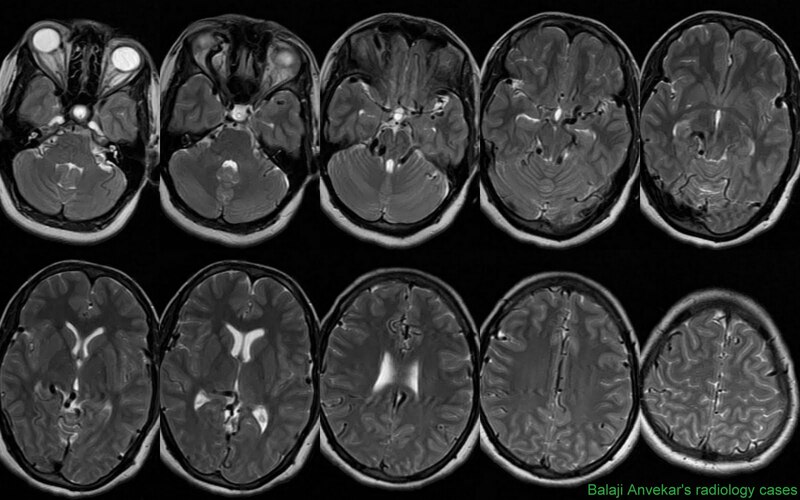 Unfortunately, the diagnosis may be missed or delayed because such lesions occur so rarely, CT may be normal and even in case of MRI, a common practice of inadequate sequences particularly screening protocols may miss the diagnosis. Dural AV fistula are shunts between the meningeal arterial networks and the dural venous sinuses. Long standing dural sinus thrombosis result in obstruction in venous outflow which raises intra cranial venous sinus pressure. This venous hypertension leads to ischemia, followed by aberrant angiogenic activity along the Dura. CVT here is the primary event that result in venous hypertension and fistula. Sinus thrombosis may be the primary even as result of turbulent flow in the Dural venous sinuses secondary to DAVFs. Intrasinus stenting can relieve raised venous sinus pressure but may increase arteriovenous pressure gradient and shunt flow.